Sheepshead, It's whats for dinner! Sept 23, 2018 I absolutely love when things come together. Friday September 21st Kevin and I went out on a very short bay trip . Our goal was to just grab some fresh sheepshead and come back . We did grab a few eels as a just in case but never used them because the wind ended up kicking in much sooner then anticipated, but no worries it was still a great trip. We drove to a location anchored and managed 6 sheepshead in just about under an hour. The hot bait of the day was fiddlers on a 3/0 owner hook and carolina rig with 40 lb fluorocarbon leader and 4oz egg sinker. Then it happened! I lost a huge one at the boat side. Kevin is standing there with the net in his hand, and we saw this enormous pig of a fish come to the top. The sheepshead yanks & twists it’s body in ways we don’t care to discuss ( ha ha) and then suddenly, all that was left was a bent hook and a tooth! I’m not a bling girl but , the fish leaving just a tooth is a first for me so I plan on making a necklace with that sheep tooth, and if folks ask when they see it , I will call it “ the one that got away! “ Ha! This fish was easily 12 plus pounds and although it was disheartening that he got away, but it was amazing at the same time. There’s more , this fishing report does not stop here because the reason why we went fishing was to get fresh fish and leave early Saturday morning to drive to West Virginia to visit my father spontaneously . 💕. The morning after I arrived to my dad’s house , I went to church and ran into a friend of mine Erin and her father. I have known Erin since first grade so I really enjoyed seeing them and briefly catching up. Then during the rest of the day my dad and I spent some quality time together , just being together. Oh and “ Lou “ my dads very amazing cat wanted to ensure he was a part of that , ha ha as he followed me and didn’t want to miss a thing .Then tonight’s dinner was , you guessed it , the fresh sheepshead Kevin & I caught Friday. I served it with some yummy German Gewurtztraminer wine . Simple is best sometimes and I’m so glad I did this. I want to take a moment to encourage everyone out there to do something spontaneous for those you love , even if for a single day or just a few hours. I hope everyone had a fantastic weekend , Tight Lines Everyone! You can either stove top fry fillets after seasoning them to your taste or bake them . This recipe will discuss baking them.. Simple prep for me would be Ocean sea salt & lightly apply crushed pepper, sprinkle moderate amount of Paprika , add a sprinkles of fresh or dried parsley then pour some melted butter on top of fillets (a few table spoons will suffice ) and also sprinkle some white wine , I prefer a non dry semi sweet white like a Riesling or a Gewürztraminer. *Oh it’s also recommended the chef pour a glass for themselves while preparing the dinner , ha! I am also a big fan of Ragin Cajun spice ( the blue can) it’s really amazing addition to seafood and chicken but please keep in mind that Too much of it If added will over power the fish ..
For thin to medium fillets about 12 to 14 minutes should do it , thicker larger fillets may need to cook for at least 15 to 20 minutes depending on size and thickness . The best way to tell if a fish fillet is done is to use a fork on the fillet on the near the end ( or center if a thick fillet) to gentle attempt to move the fish. If the fish flakes easily then the fish is done . Do not over cook because over cooking will dry out your fillet. I have cooked this recipe with a higher temperature setting when I have a lot more fillets that I’m trying to cook at the same time . I’ll usually increase the temperature to about 410 to 415 degrees to ensure that all of the fillets are thoroughly cooked . Adjusting temperatures is perfectly fine as long as you watch them. I do NOT recommend the broiling of sheepshead. I have seen fillets curl up and dry out and the taste is not as good at really super high temperatures with this fish , (just my 2 cents). 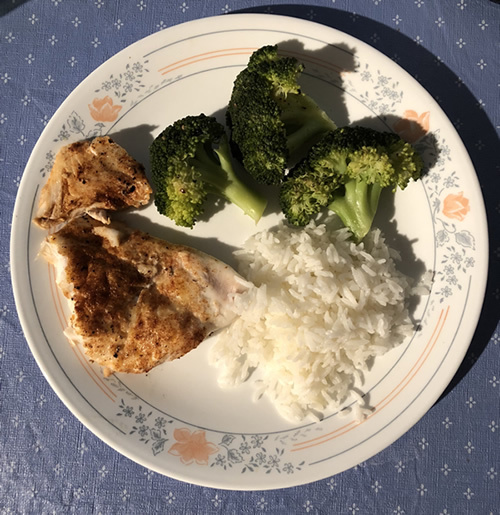 Serve with steamed broccoli and jasmine rice ( user the rice cooker for the jasmine rice is best and easiest way to prepare if you happen to own one) .